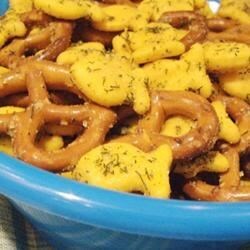 "Easy and delicious snack mix with a dilly ranch seasoning. I tone down the cayenne pepper and send this to school with the kids too! You can also substitute pretzels or goldfish for other ingredients you like, such as cereal, crackers, or nuts." Stir the popcorn oil, ranch dressing mix, dill weed, garlic powder, lemon pepper, and cayenne pepper in a large bowl; add the pretzels and fish crackers and stir to coat evenly. Spread the mixture onto two jelly roll pans. Bake in the preheated oven, stirring once, until lightly toasted, 15 to 20 minutes. Transfer mixture to a flat surface lined with waxed paper to cool. A pet Walker is in heaven. My little girl and I made these together, not only did we have fun but it turned out yummy! We did forget to pt the dill in there though.